In 1918, the working class put an end to the First World War. In Germany soldiers turned their guns on their officers, workers set up soviets across the nation, prisons were stormed, and red flags hung upon public buildings. Revolutionary organisations were overtaken by the events. The Spartacus League, led by Luxemburg and Liebknecht, only split to form the KPD a whole month after the revolution broke out. The Third International is born three months later. All too late – by that point, the Social Democrats of the SPD were so well ingrained with the working class that they controlled the majority of workers’ and soldiers’ councils. The outcome? The Stinnes-Legien Agreement. To bring peace between capital and labour, the SPD made a deal with the officer corps and the capitalists. Unions were recognised, workers' councils were turned into works councils, the eight-hour day was introduced. The vanguard of the working class was not satisfied however, and met the wrath of the liberal republic – paramilitary militias were sent out to deal with revolting workers, killing thousands of worker-communists and their leaders – among them Luxemburg and Liebknecht. All under the watchful eye of Social Democracy. In that same period, revolutions in Hungary, Finland and Bulgaria were likewise crushed. Order prevailed. In 1968, students set up barricades on the streets of Paris. They occupied the universities. A few days later, 9 million workers go on strike, in some cases taking their trade unions by surprise. They occupy their factories and set up workplace committees. Despite calls for their formation, no real workers’ councils emerge. Stalinists and Social Democrats spread confusion among the working class, trying to divide the workers against the students. The unions remain in control of the movement. Half a century after the Russian Revolution the working class still has not recovered from the counter-revolution of the 1920s. It lacks its revolutionary memory and fails to create a party to lead its assault on the system. The outcome? The Grenelle Agreement. To bring peace between capital and labour, the unions (CGT, CGT-FO, CFDT, CFTC, CGC, FEN) made a deal with the employers and the government. The minimum wage was raised, a reduction in the working day was introduced, trade union rights were improved. Some of the strike movement rejected the agreement, but divided more than ever, it collapsed soon after new elections were held (in which the Gaullists won a majority). Similar movements in Italy and Czechoslovakia were likewise diverted or crushed. Order prevailed. In 2018, we see dispersed and fragmented struggles across the globe. In Iran, to everyone's surprise, workers are once again calling for “soviets”. 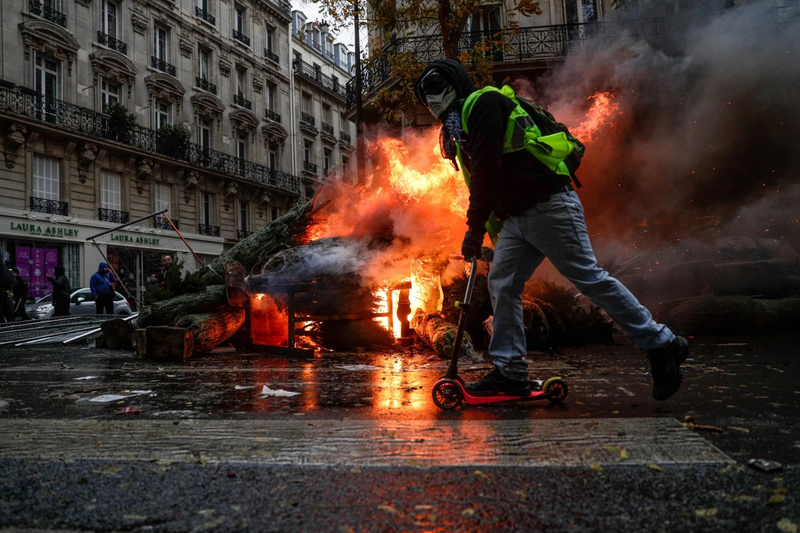 In France, a disparate movement of Yellow Vests has forced some concessions from Macron, all without the involvement of unions or parliamentary parties. In Iraq protesters donned Yellow Vests against poor services and corruption. In China, over 1000 strikes have taken place this year alone. In Venezuela and Nicaragua we see the dead end of the “pink tide”, as mass demonstrations spread and workers resort to looting in order to survive. It would obviously be premature to draw parallels with 1918 and 1968 – but it is a sign of things to come. Many of those involved in these movements will be looking for a political and organisational reference point. The question is who will provide it. In the face of the capitalist crisis, more and more, we see how the current “order” is built on sand. The nationalists and progressives have, as ever, rallied around the banner: "If we want things to stay as they are, things will have to change." Orbán, Bannon and Salvini. Varoufakis, Sanders and Corbyn. They will try to derail the movements of the future by presenting false alternatives – be it nationalisation, new deals, border patrols, police on the streets. New “agreements” will be put on the negotiating table. Spontaneous struggles will be their prey, easier to manipulate as they are. Internationalists have to be there in advance, among the working class, to dispel illusions and out false friends who will sell-out the movement (be they Social Democrats, unions or the Stalinists, i.e. the left of capital).